• Diabetic eye screening – in line with national guidelines including pupil dilation and retinal photography for those eligible (i.e. those registered with a GP in Dorset). • Glaucoma screening & Hospital shared care – routine screening tests include eye pressure measurements, Optic nerve assessment, peripheral vision testing and further investigations if required. 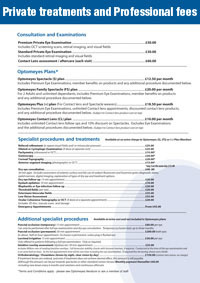 • NHS and private examinations – we also accept optical vouchers for those entitled to help with health costs. • Contact lens specialists – see the contact lens section. • Digital imaging of the internal & external structures of the eye – this allows documentation for future reference. • Children’s examinations– They do not need to be able to read! We can examine any child from newborn up to check for normal development. • Hospital cataract referral centre– We can fast track referral direct to the Bournemouth Eye Hospital. • Advanced scanning techniques – pachymetry/ corneal topography. • Blood pressure monitoring if required. • VDU Specific testing – in line with HSE ‘display screen equipment’ requirements. Contact us for details of corporate packages. • Low Vision assessments for those with poor vision. • Coloured overlay testing for specific learning difficulties. • Punctal occlusion for severe dry eye.